With the passing of George Carlin this week my entry is dedicated in his memory. Matthew Barry did the same in his blog, The Talented Mr. Roto, and has more of a connection to Carlin than I ever have. I did enjoy his comedy and watched his specials whenever I could. Carlin’s bit on "Stuff" is an interesting take on stuff. We all have people's stuff. Stuff in our house and our pockets. We’re always taking stuff where we go. Bars have stuff. Some bars have more stuff than others. 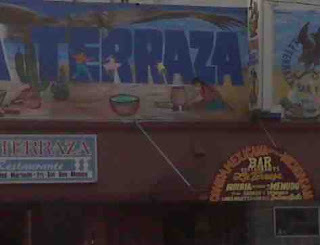 La Terraza has plenty of room for stuff. 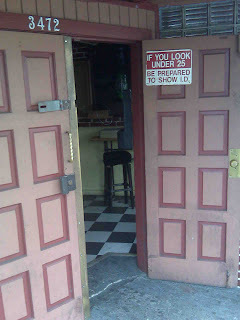 There’s new stuff I haven’t encountered at Mission Street bars before old stuff that seems to be a running theme on my journey. Two entrances one for the restaurant and one for the bar. A stage, band equipment and everything, though I don’t see how any more than 2 people can be on stage at a time. A red padded ceiling above the bar area (maybe for noise or maybe just to give it that nice comfortable insane asylum feel) and padded arm rail to rest your elbows (this is a nice touch). An old school Mission Street homie who needed a cane to walk and if he wasn’t so drunk I’d ask him about his injury. We did pound fists, so I felt right at home. A Mariachi bobble head behind the bar (I have to get me one of those for the office). A Virgin Mary poster (I would have thought I’d see more Mary’s by now). Dominos being played at one end of the bar with the owner (better than dice?). Chocolate Milk (Warm chocolate milk, now that’s what I call mixing your drinks. Milk to beer, can’t be good). Piñatas hanging from the ceiling. Mariachis asking if we want a song (now I know I’m getting to the Mission when I start seeing Mariachis). Female bartender, Francia, already 3 beers deep when I first walk in. Almost all guys drinking at the bar and no other women (Except for one who arrived later and ordered the chocolate milk. It did take me a while to figure out it was a girl). Juke box playing loud Spanish music. 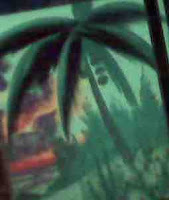 Bad art on the walls this time a painting of a tropical beach scene spanning the wall of the restaurant’s seating area (I bet those colors pop in the dark!). A TV (old) shows a Spanish Novella (soap opera, new). Everyone drinking Miller High Life or Modelo (old). Drinking the Modelo with freshly squeezed lime and a touch of salt (new). After the last couple of bars I expected this place to be a little busier considering it is in a more active part of Mission Street at Cortland Avenue. There’s a bus stop right outside the door which to me would help drive your walk in business. Overall the bar stayed pretty empty. I’m learning a few things on my journey and it is easier to walk into new dark doorways waiting to see what will happen next. People are always welcoming and as slow as the bar may seem there’s always something I can pull from my time there. Will I go back to La Terraza? Maybe but I’ll have to check and see when a band is playing, now that would be interesting. 1. Can I have a Martini? 2. Do you have Cold Play on the Juke Box? 3. Can you change the channel to Friends? 4. Do you mind turning the music down? 5. Isn’t it a little early to be that drunk? 6. I’m in the mood for a Napa Valley Pinot, what do you recommend? 7. Is this place in Zagats? you're the gayestmexican drunk evah. gusto gay pride week. or whatever. I have noticed that at 50% of the bars that you have reviewed there have been women whom you have questioned if they are "truly" female.